I received my sofa this past Thursday, and I’m very happy with it! It was definitely worth the wait, thank you. Normally I’d pass on being on a blog, just not my thing, but I’ll make an exception!. A couple of pics are attached. 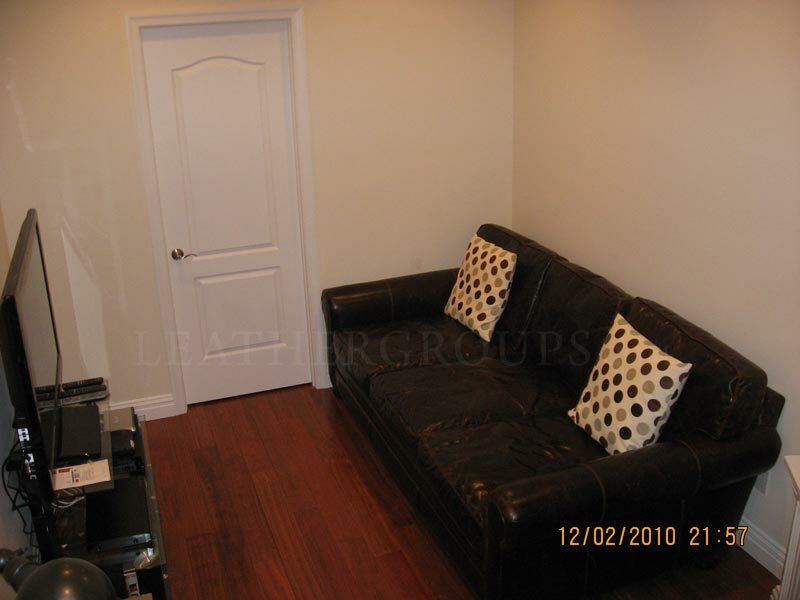 But brace yourself, this is undoubtedly the smallest apt a sofa like this was ever squeezed into! Gotta love NYC living! I had to call Dr. Sofa and they chopped it up in the hallway for me. Was very painful to watch, but it’s still like brand new. 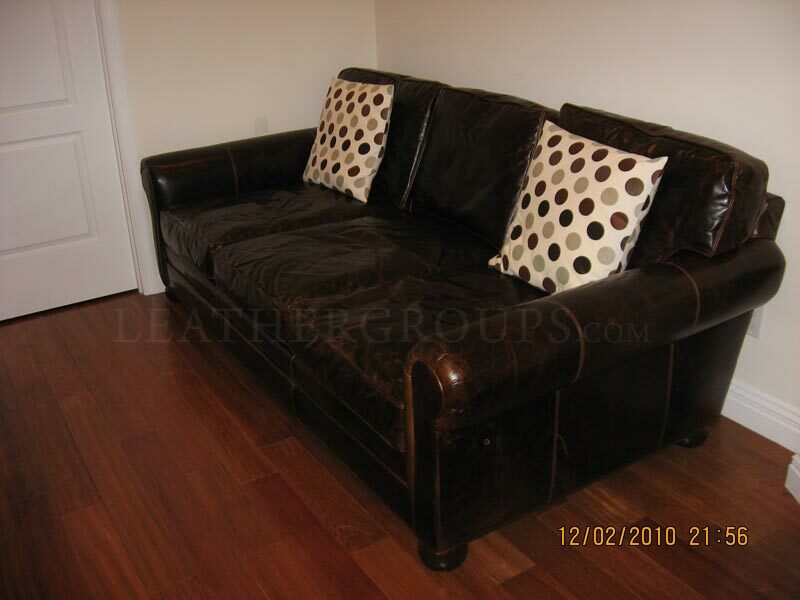 This entry was posted in LeatherGroups.com Reviews & Testimonials and tagged 48" Deep, aniline dyed, Brompton, Brompton Cocoa, brompton cocoa mocha, buying leather furniture, customer reviews, Customer Testimonials, deep, full aniline, lancaster, lancaster leather collection, lancaster leather sofa, langston collection, langston leather sofa, product reviews, pure aniline, restoration hardware, reviews, testimonials on December 3, 2010 by DanKan. Wait a second, Dr. Sofa?!! They chopped the sofa to get it in?!! Now I’ve heard everything! Yeah it’s a trip to watch, they’re like surgeons. They reinforce everything when they put it back together, and you can’t tell anything was done to it all. They completely cut it in half, walked in the pieces, and reassembled it! All in about 2 hours. The same thing happened to me when I bought my new couch, It didn’t fit thru the door, I also called Dr. Sofa, they did an amazing job, just like DanKan says, took them less than 2 hrs to finish and my sofa is sitting inside, everything reinforced you can’t tell it was ever taken apart! I can definetly believe it.Dr Sofa came in and took apart my crate and barrel sofa and they took apart my 108″ kensington sofa from restoration hardware.I knew they would be able to do a simple 6ft sofa but a 9ft restoration hardware with nailheads and tuffting it blew my mind when i came home and saw it actually sitting in my living room. Dan, thank you so much for using our services, we are glad we were able to help you get the furniture you want in the space you need it. Furthermore we appreciate you sharing your experience with your audience. We would like to extend and invitation to our website, http://www.drsofa.com to leave a feedback (lower right corner) , to show our appreciation you will receive a 15% off coupon for your next service, which shows up automatically once the survey is submitted. We are looking forward to read your opinion.